Some of you may have noticed that of late I’ve spent an inordinate amount of time ‘fiddling about’ with my compost heap on ‘A’ road, frequently wielding a rather dangerous looking temperature probe. Whilst fairly oblivious to accusations of an ‘obsessive ‘ personality, I think its time to explain what has been going on for those not ‘in the know’. To determine the effect of various ways of storing, handling and composting manure bearing in mind the weather i.e. good, indifferent and bad practice. There seems to be a very good Nitrogen content in the ‘as delivered’ state of the horse manure. The Carbon:Nitrogen ratio appears to be in the 25:1 to 35: 1 region, probably at the lower end of this region which is good, offering the possibility of incorporating non-nitrogenous plant matter without overly slowing or inhibiting the natural aerobic composting process. Provided correct handling, hydration and aeration is carried out, weed and seed killing temperatures can be maintained for up to 6 weeks within the core, and a temperature – time profile ideal for rapid break down to a fertilising humus can be maintained. This is typically over a duration of 90 – 120 days. when things cool down a bit (60-65C), aeration can be deliberately induced to maintain thermophillic and aerobic bacterial activity for as long as possible -until the natural maturation phase begins at around 60 days. In winter and wet, windy or cold weather, it would seem profitable to cover the heap to stop it being chilled or becoming waterlogged. A semi-porous material that can breathe (carpet) is to be preferred, plastic seems to encourage unwanted fungal growth. In this respect, sieved earth is again doubly useful and in summer too, can prevent the rapid drying out of the exposed surface. The case for containerisation is far from black and white, but in the winter can definitely help during the intermediate phase when maintaining thermophile activity can be a problem due to freezing temperatures. Whilst the constituents should be kept damp, waterlogging is definitely not desirable. The core of the latest heap is still above 60C (140F) after 5 weeks whereas without two remixes and considerable re-hydration (about 15 gallons/re-mix) it would barely be above ambient. The first heap, now over 11 weeks old and having been turned five times is about 40C (105F) in the middle, now maturing nicely with Brandlings starting to populate the cooler areas. Another 2 or 3 weeks and I’ll be looking to see if most of it has really composted down to a nice humus and whether the original constituents are unrecognisable. If so, it’ll be easily tilled in to any bare land during September, helping to restore earthworm counts, nitrogen, nutrient and moisture content during Autumn and Winter. Equally, it could be safely tilled in around winter crops, without damaging or checking their growth, since it should be a very good match to the soil. Delivered as over 3 cubic yds, it’ll be about half this when finished, sufficient for about a quarter of a plot at 1″ deep. NB. 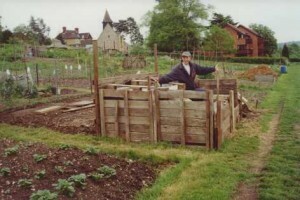 A 4 page FAQ on aerobic composting is available here. Also an Excel template for recording temperatures to produce a self-plotting chart and a completed sample chart.